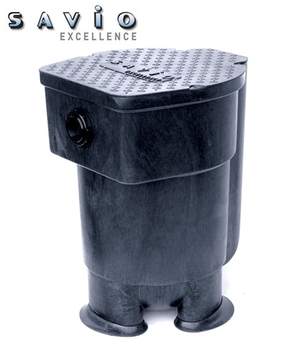 The Versatile Filter is used on nearly all our Aquaponics systems. This Filter harness's the natural dynamics of moving water. 30% of a square box filter is simply unused corner space, the other 70% is active at startup. Within 8-10 weeks the media begins to clog and filter efficiency drops to just 20-30%! By contrast this filter runs at nearly 97% efficiency at startup and maintain 85-90% efficiency at 8-10 weeks using Springflo media. 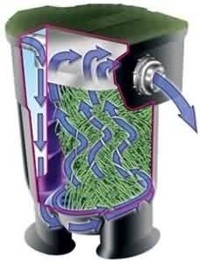 We recommend this filter to be used with any home system, regardless if you are using our system or operating grow bins or plant runs of your own design. Filtration is key to any operation involving fish and plants. The filtered solids can easily be backwashed and recycled in the aquaponic system. See our Sucessful Aquaponics for the Family manual for further details.